In the third year in the reign of Longqing (lóng qìng 隆庆) in the Ming Dynasty(1569), Chengfan prefecture (chéng fān fǔ 程番府) in Guiyang was renamed Guiyang prefecture,From then on,Guiyang, as a name of an administrative area, has been used until today, with a history of over 400 years.In 1913,Guiyang was made capital of Guizhou province, In 1941, Guiyang officially became a city. China is one of the world’s oldest continuous major civilizations, with written records dating back 3,500 years. Turtle shells with markings reminiscent of ancient Chinese writing from the Shang Dynasty have been carbon dated to around 1,500 BC. These records suggest that the origins of Chinese civilization started with city-states that may go back more than 5,000 years. Two thousand years ago is commonly used as the date when China became unified under a large kingdom or empire. Successive dynasties developed systems of bureaucratic control that would allow the emperor to control the large territory that would become China Proper. The forced imposition of a common system of writing by the Qin emperor (200 BC) and the development of a state ideology based on Confucianism (100 BC) marked the foundation of what we now call the Chinese civilization. Politically, China alternated between periods of political unity and disunity, and was occasionally conquered by external groups of people, some eventually being assimilated into the Chinese population. Cultural and political influences from many parts of Asia, carried by successive waves of immigration, merged to create the image of Chinese Culture today. Guiyang falls within the monsoon climate in subtropical zone that is temperate and humid without severe winters or hot summers, characterized by abundant rainfall and longer frost-free period, with the annual average temperature 15.3°C; the rainfall 1197 mm; the relative humidity 76.9% and the frost-free period about 270 days. The hottest day occurs in late July, and the coldest in early January. People in Guiyang are proud of the pleasant climate and often compare it to Kunming as "Another Spring City". Rain falls throughout the year, with occasional flurries in winter. It is also one of China's least sunny cities. Guiyang City’s climate has obvious plateau monsoon climate characteristics. It belongs to the moderate-humid subtropical climate. The annual rainfall is about 1200 mm. Because of the effect of global warming, the heavy rain concentrates in the annual July or June. The annual average temperature is 15.3 centigrade. The hottest month happens to be in July. It is often 24 centigrade. The coldest month occurs in January. It is about 4.6 centigrade. In historical records, the lowest temperature is under 9.5 centigrade and the highest is 39.5 centigrade. The frost-free period lasts about 270 days. The pressure is higher in winter and lower in summer. There are some types of natural disasters, such as hail, rainstorm, high winds and acid rain. Guiyang enjoys a pleasant moist subtropical climate with sufficient sunlight and plenty of rainfall due to its geographical features. There is no extreme heat in summer and overly cold in winter. The annual average temperature is about 15 degree Celsius, and July is the highest month of the year with an average temperature of 24 degree Celsius while January is the coldest one, averaging a temperature of 4.6 degree Celsius. So, all of the year are available to plan your tour in Guiyang, most of the minorities festivals are generally held in March or April. 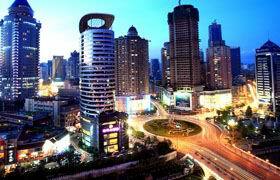 Influenced by the humid subtropical climate, Guiyang is neither too hot nor too cold. 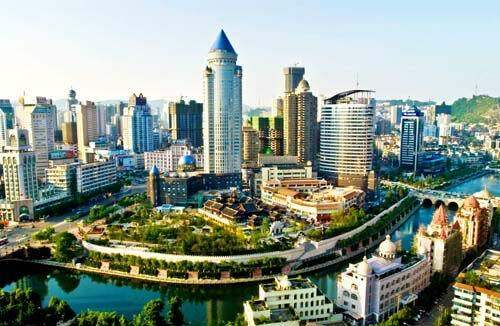 With abundant sunshine and rainfall, the annual average temperature of Guiyang is 15.3°C (59.5°F). The hottest days in July are only 24°C (75.2°F) on average and the coldest days in January 4.6°C (40.3°F). 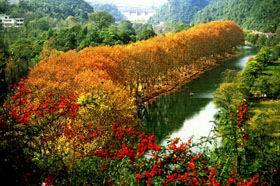 Hence, Guiyang is suitable for visiting all year round. But the best time to visit Guiyang is March and April, when many traditional festivals of the minority peoples are held. Due to the sharp temperature changes between day and night and the strong ultraviolet radiation, it is best to bring a coat and wear a good sun block while visiting. Some cultural activity places such as singing and dancing halls, karaoke halls, bowling clubs and book markets are popular places of resort. At present, there are more than 3,000 business owners in the market of culture, among which 300 are engaged in singing and dancing halls; 900 in audio-visual projects; 1,000 in video games and bowling; 500 in books, magazines, newspapers and print; 300 in other items. Many cultural relics were left in Guiyang, which attest to its rich history. Originally built in 1667, it Hongfu Temple (hóng fú sì 弘福寺) is the largest temple of Zen Buddhism in Guizhou Province. It features majesty and sobriety. Hongfu means to develop Buddha's spirits and to benefit mankind. Today it is rated as one of the 142 national key temple scenic areas as well as the key cultural relic preservation in Guizhou Province. On entering the gate of the temple, you will see the Bell Tower and the Drum Tower on both sides. The bronze bell weighs more than 3,000 Jin in Chinese measurement (equal to about 3,300 pounds), and was cast in 1469 during the Ming Dynasty (1368-1644). In the first hall named Heavenly King Hall, you can see the statues of Maitreya Buddha and the four Heavenly Kings. On the walls there are also steles of sutra and colorful paintings. The second main hall is the Bodhisattva Hall dedicated to Bodhisattva Avalokiteshvara with 32 arms. In the third hall named Mahavira Hall there are gilded statues of Sakyamuni and the 18 Arhats. There's also a jade Buddha statue from Rangoon, the capital of Burma. It is 1.5 meters high and weighs 900 kilograms. The statue looks beneficent but solemn, and it stands among more than 10 other jade statues of Bodhisattva and Maitreya. Location: Qianling Mountation; about 1.5km away from downtown. The park was named for the Qianling Mountain (qián líng shān 黔灵山), which is the most famous mountain in southern Guizhou. As one of the noted attractions on the Guizhou plateau, it boasts clear water, green mountains, tranquil forests and old temples. Inside the park, trees verdantly grow and streams gurgle down into the valley. There is a "holy fountain" up the mountain whose water is so clean that local people consider it coming from the heaven. The flowing steams from the fountain and the mist surrounding the forest make it one of the greatest eight scenic spots in Guiyang. The lake of Qiangling lies at the foot of the mountain like a green pearl. Trees and pavilions are seen around the lake, which constitutes a peaceful and elegant atmosphere for the visitors. More than 500 energetic and enchanting macaques live in the mountain in the park and this add to the features of the park. 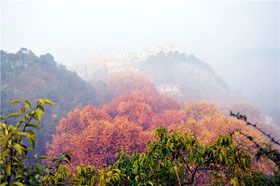 About 1500 kinds of trees and flowers as well as 1000 kinds of herbs have been found there in the Qianling Mountain. And there are gregarious macaques and flocks of birds too. 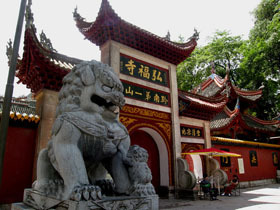 Visitors may go up the winding path to the Hongfu Temple up the hill. This temple is one of the most famous Buddhism temples in Guizhou province, which is first built in the year 1672. On the way to the temple, up in the sharp cliffs, stone inscriptions can be seen here and there. Among them, the most notable one is the 6.2-meter-high and 3.7-meter-wide Chinese character of "Tiger", which was written by a man in the year 1860. Its calligraphy is skillful and unique and is of high history value. Up on the top of the mountain, there is a pavilion, which overlooks the whole city. Down at the foot of the mountain, lies the mirror-like lake of Qianling. On its bank, among the trees, stands a memorial for the martyrs who died during the war of liberation of Guizhou Province. Jiaxiu Tower (jiǎ xiù lóu 甲秀楼) is a magnificent 3-level pavilion about 20 meters high. Its turnup eaves and white stone pillars are well carved and preserved. Located in water, connected by the Fuyu Bridge (fú yù qiáo 浮玉桥) at two banks, the tower has green tiles, red pillars, engraved windows and white stone parapets, which makes it superb and striking. Ascending the tower, visitors can get a good view of the surrounding scenery. The tower has a long history. During the Ming dynasty (1573-1620), the local majesty, Jiang Dongzhi (jiāng dōng zhī 江东之), ordered to build a causeway at where the tower locates today, linking to the southern bank of the Nanming River. Later a pavilion was built to honor the first scholar of the time and hoped that would encourage more scholars to follow the example. Thus the tower was named "Jiaxiu tower", which means "First Scholar's Tower". In 1621, the original pavilion was burnt in a fire and the stadholder of the time made it rebuilt. 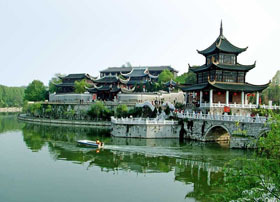 In 1689, it was destroyed again, and then, Majesty Tian Wen (tián wén 田雯) rebuilt it again. So far, the tower has been reconstructed 6 times. For 400 years, it has become the symbol of the city, witnessing the history as well as the future of the development of the Guiyang city. Huaxi Park (huā xī gōng yuán 花溪公园) belongs to the Huaxi scenic spot area, which is 350.5 square kilometers in total. The most beautiful feature is the clear streams winding through hills and the flowers providing beautiful displays throughout the four seasons of the year. Scenic attractions of the park are centered on the four small and exquisite hills: Unicorn, Phoenix, Turtle and Snake. The Unicorn Hill is the major one of the four. It resembles the shape of a prancing unicorn. On the top of the hill, stones of various shapes stand upright like the horn of the unicorn. The water of Huaxi River is clear and clean. Flowers bloom all year round in the park. Boats are available in the park for visitors to rent. A boat tour offers views of beautiful landscapes along the entire river. Visitors also can take a rest at pavilions or terraces under the shade of trees and enjoy the peaceful atmosphere of rurality. The Tianhe Pool (tiān hé tán 天河潭) scenic resort area covers 15 square kilometers. It centers on a clear pool surrounded on all sides by steep cliffs covered with green trees. Tianhe Pool is a typical naturally sunken pit of calcified rocks. The scenic area has four major sections, including a calcified stalactite waterfall, a water cavern and a dry one, each with its own characteristic features. There are two natural limestone caves in the cliffs. One of them is a treasure house of stalactites of different images. 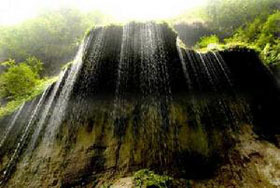 The 210-meter wide stalactite waterfall is the widest of the kind in China. Roaring waters from the hill create caves of different sizes and shapes. When the waters are abundant, they are like jumping tigers and running horses; when the waters are not so powerful, mists from the river fly at the gust of wind. The 100-step stone bridge over the Wolong Lake (wò lóng hú 卧龙湖) cast its reflections in the mirror-like water. All constitutes beautiful scenery in the Chinese painting. Hongfeng Lake (hóng fēng hú 红枫湖) is an artificial lake on the Guizhou Plateau, built in 1958 when the reservoir was under constriction. A lot of maple trees grow around the lake on the mountain, and the lake takes its name since these maple trees' leaves turn red every fall. 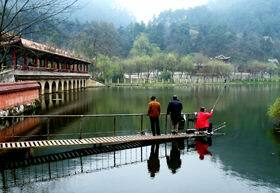 The scenic area is made up of four parts: the North Lake, the South Lake, the Rear Lake and the minority ethnic villages, each radiating its unique charm. 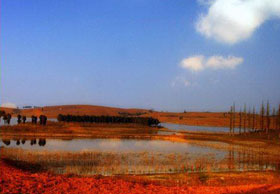 Hongfeng Lake can be appreciated at four different seasons. In spring, visitors may enjoy the blooming of the flowers; in summer, visitors may play with the clear and clean water; in autumn, the trees will display various colors; and in winter, flocks of birds will make it a good place to visit. 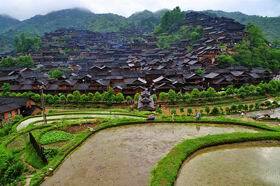 There are some ethnic villages with interesting examples of village architecture in the scenic area, including a DiaoJiaolou (diào jiǎo lóu 吊脚楼), Miao traditional house, a Buyi flagstone house and a Dong drum tower that has a roofed bridge. The drum tower can be reached by boat. In accordance with village custom, visitors will get a warm welcome; they may taste many special ethnic foods and snacks there too. It will be such an interesting experience that they may be reluctant to leave. Nanjiang Canyon (nán jiāng xiá gǔ 南江峡谷) is a newly developed scenic spot. It is 40 km long,with a maximum depth of 250 meters. Inside the canyon, there are more than 80 natural attractions including more than 40 waterfalls. White-water rafting is the most thrilling attraction for energetic travelers to the canyon. There are numerous fascinating peaks, caves and breathtaking shoals along the river. In the scenic area of Ladder Cliff, the steep banks sandwiching the narrow river appear to have been chopped by a giant axe. At the end of an 800-merte-long funnel-shaped section, the river becomes so narrow that the branches of the trees growing on opposite banks overlap. Waterfalls of big and small, 48 in total, cascade into the canyon. One of these, Bell Waterfall, is a typical travertine fall. The 30-metre-high rock from where the water gushes down conceals a limestone cave, which allows visitors to "enter the rock" and watch the falling water from within. Also known as Underground Park, Nanjiao Park (nán jiāo gōng yuán 南郊公园) is seven kilometers south of Guiyang. 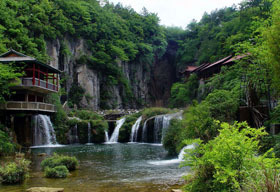 It is one of the developed tourism areas in Guizhou, featuring hills, waters, caverns, and forests. Its 587-metre-long White Dragon Cave displays a wonder world of stunning stalactites. The White Dragon Cave is the central focus of the park. The cave, a 587-metre-long tunnel, is divided into two sections. A myriad of stone curtains, stone flowers, stone pillars and stalagmites fill the cave, turning it into an exotic fairytale world. The scenery above the cave is also charming. Hills reflect in the water; water runs around the hill. The beautiful landscape makes the tourists reluctant to leave. Baihua Lake (bǎi huā hú 百花湖) is located in the northwest suburbs, about 22 kilometers from the downtown area. 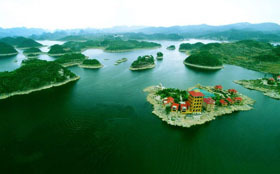 This is a man-made lake with more than 100 charming islands, covering an area of 83 square kilometers. 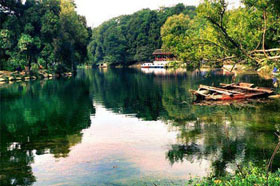 The scenic area features Karst landscapes and crystal-clear waters. 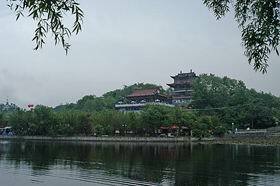 And it has the nickname of "Mini Guilin"(xiǎo guì lín 小桂林). There are more than 50 scenic spots here and 23 of them are open to visitors. There are also limestone caves on some of the islands. Bird island is one of the most famous one, a natural habitat of different kinds of birds. When spring comes, hundreds of birds float over the island, which makes it a fantastic view for the visitors. Another feature of the lake is the village sites, situated along the lake. In the evenings, when fishermen finish their job and park their boat at the bank, cooking mist rising from the house, it looks like a fine Chinese traditional wash painting. The Longdongbao (lóng dòng bǎo 龙洞堡) Airport, a newly completed international airport in Guiyang, was launched into service on May 28, 1997.Now, air routes had been opened to link up Guiyang with 32 cities including Hong Kong, Beijing (běi jīng 北京), Guangzhou (guǎng zhōu 广州), Shenzhen (shēn zhèn 深圳), Shanghai (shàng hǎi 上海), Chengdu (chéng dōu 成都), Chongqing (zhòng qìng 重庆), Kunming (kūn míng 昆明), Guilin (guì lín 桂林), Xiamen (xià mén 厦门), Xian (xī ān 西安), Haikou (hǎi kǒu 海口), Changsha (cháng shā 长沙) and Wuhan (wǔ hàn 武汉). Four trunk lines radiate from Guiyang to neighboring provinces with a total mileage of 1,468 kilometers. Electrification transformation has been completed along the Guiyang-Kunming, Sichuan-Guizhou and Hunan-Guizhou railways. Guizhou is a key area for railway construction in the country. So far, the section of 227 kilometers within Guizhou Province on the Nanning-Kunming Railway has been launched into service. Construction of the second electrified track of the Shuicheng-Zhuzhou Railway which will include 596 kilometers running through Guizhou and which is to be the largest east-west transportation line in the country is soon to begin. Construction for the Shuicheng-Boguo and Huangtong-Zhijin railways with investment by both the central and local governments will also begin very soon. Once completed, these transportation archeries will further elevate Guizhou's position as a major transportation pivot in southwest China, and benefit the economic development not only in Guizhou but also in neighboring Sichuan and Yunnan provinces. Now there are over 30,000 kilometers of highways in operation in Guizhou, including five national highways and 30 provincial trunk lines, which constitute a highway network with Guiyang as the center and linking up all cities and counties in the province. The first high-standard highway in the southwest, Guiyang-Huangguoshu (huáng guǒ shù 黄果树) Highway has been completed while the one of the same standard between Guiyang and Zunyi (zūn yì 遵义) was built in 1997. Three major horizontal roads and three vertical ones constitute the modern transportation networks of Guiyang city, with about 20 interchanges of various functions. There are about 1600 public buses running along 108 different bus routes and about 2000 taxis in the city, covering all the city area and the three suburbs. All the buses are self service.